It's almost a month since I post any new recipes in the blog. Could not post due to health issues. Have taken a oath, from now onwards will post atleast one recipe a day. So, started with a healthy and sweet snack item -- Til Chikki. Til chikki is really a healthy midday meal. Til or sesame seeds are rich sources of calcium, iron and copper etc., Sesame seeds with jaggery is really a good source of iron and calcium. This helps in increasing the bone health and also helps in blood purification. It is sugggested that we should take it in winter. It keeps the body warm and protects us from seasonal diseases. It is very easy to make and there is no chance of spoiling it. 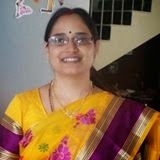 We can make chikki or even laddu with the same ingredients. If unable to make chikki or patties, just make small laddus. They are also good for health. 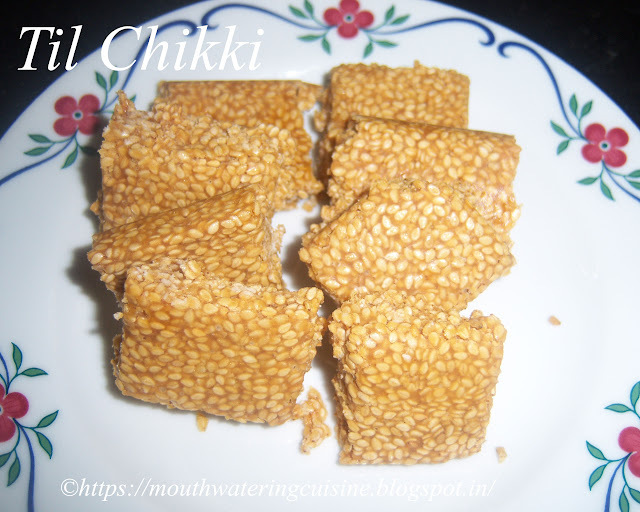 Til Chikki Recipe --a nice combination of jaggery and sesame seeds -- healthy midday snack. Grate jaggery and keep aside. Heat kadai and dry roast sesame seeds till the aroma comes out Or till they crackle. Keep them aside. Heat 1/2 tablespoon ghee in the same kadai, add grated jaggery. Allow this to melt and boil, when it comes to rolling boiling point we have to check it's consistency. To do so, pour a drop of it in cold water, it should become soft and stiff strings. Then it reached right consistency. At this stage switch off the flame and add roasted sesame seeds and mix well. Immediately pour this mixture onto the greased plate. Spread it swiftly with a spatula or by just patting the plate on cooking platform. Mark it with a knife to make desired shape and size pieces. Allow it to cool completley. Once cooled take the pieces off from the plate and serve. Serve healthy and tasty til chikki anytime in the day.